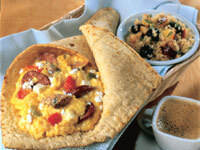 This filling breakfast wrap features scrambled eggs and chorizo or merquez sausage, red or green bell pepper, onion & feta cheese in a warm tortilla. 1. Slice sausage and sauté in a heavy skillet over med. heat until brown around the edges. Remove sausage; in drippings, sauté pepper, onion, and garlic until translucent. Add sausage back to skillet; remove pan from heat. 2. Whisk eggs with water, cumin, and salt and pepper to taste. Replace skillet over med. heat. When hot, add eggs. Scramble until barely set; sprinkle feta on top. Cover skillet and cook just until cheese melts slightly and eggs are set. 3. For service, wrap eggs in lavash, forming a cone-shape. Place in napkin-lined baskets and accompany with fruited couscous salad.